Offer is valid from 12 midnight, AEST, August 1, 2018, to 11:59 p.m., AEST, August 31, 2018. Limit of one free Pine 5ml, Peppermint 5ml, Cool Azul Sports Gel, Stress Away 15ml, Mister 5ml and Brain Power 5ml per qualifying Standard Order. Limit of one free Pine 5ml, Peppermint 5ml, Vetiver 5ml, Cool Azul Sports Gel, Stress Away 15ml, Mister 5ml and Brain Power 5ml per qualifying Essential Rewards Order. Limit of one qualifying standard order per month or one qualifying Essential Rewards order per month. Single orders over 190 PV, 250 PV or 320 PV do not earn duplicate rewards. 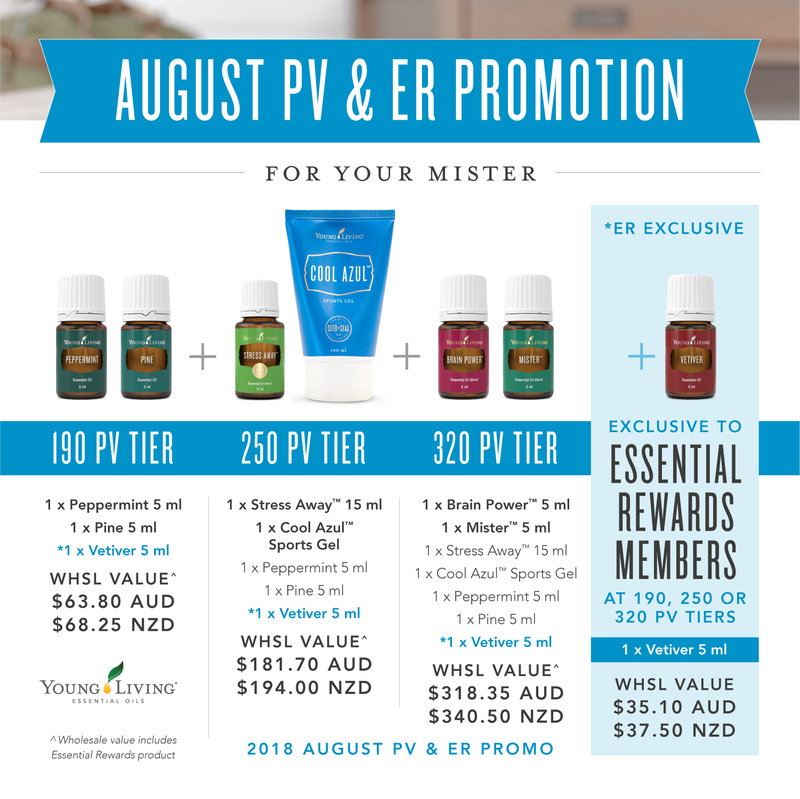 Available for all orders via phone, fax, post, web, or email custserv@youngliving.com.au.